Today was the kick-off of a long-term commitment from the Big Y grocery store in Hadley, MA to sell produce grown by UMass students in the Student Farming Enterprise class. 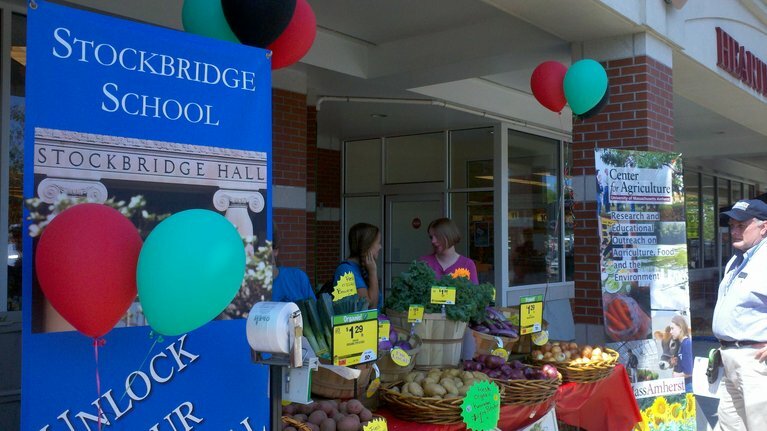 UMass instructors, Amanda Brown and Ruth Hazzard, were out in front of the store today with several of their students displaying fresh vegetables grown at the Student Farm. Please check out this short video about the partnership with the Big Y World Class Market! 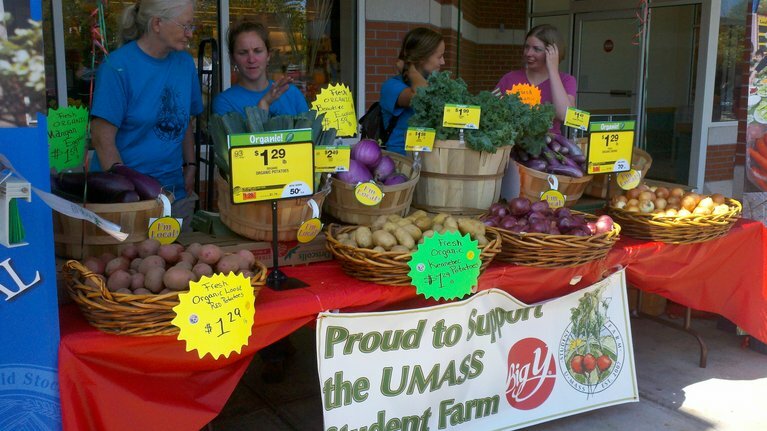 2012 Marks the 6th season of the UMass Student Farming Enterprise program at UMass. SFE began in the fall of 2007 with two students growing kale and broccoli through an independent study project to sell to the UMass Earthfoods Cafe. In spring 2008, the farming enterprise project was established as a year-long university class. This year the farm will increase production again to allow more students to participate in the course and serve more diverse local markets. The class is sponsored by the Stockbridge School of Agriculture and currently listed under the title PLSOILIN 498E – Student Farming Enterprise. The project has received support from the Massachusetts Society for Promoting Agriculture, UMass Auxiliary Services, and the Sustainable Food and Farming program. The Student Farming course is limited to 10 students (there is one opening remaining for this semester), and takes place both on and off campus. Students are responsible for identifying markets for the produce, planning out in advance for the crops, visiting farms in the immediate area, managing plants in the greenhouse, using market strategies to achieve desired yields, and learning farming methods. All produce grown is United States Department of Agriculture (USDA) certified organic. For information on the project, contact Amanda Brown at studentfarm.enterprise@gmail.com.